Nowadays, it’s difficult to think of baseball players without talk of steroids, performance enhancers, or at least strength training. More than a century ago, however, raw skill and equipment formed a power-packed duo that dictated a player’s success. “Sweet Spot: 125 Years of Baseball and the Louisville Slugger” by David Magee and Philip Shirley is as much about the bat and the company as it is about the rise of the National Pastime and our great nation. 1. How many companies can say after 125 years in business, they remain central to their industry? Yankee pinstripes; Wrigley Field; Fenway Park; Babe Ruth in a Yankee uniform. Chapter 1 begins by conjuring up images of some of the game’s fixtures. Almost as recognizable on the historic canvas is the Louisville Slugger bat. Ken Griffey, Jr. writes how he chose his first Louisville Slugger bat as a rookie. “About the only thing my father and I ever disagreed on relating to bats was which Louisville Slugger model was the best. He wanted me to use the S216 like he did, but I prefer the C271 with its smaller barrel.” (vii, Sweet) “The Splendid Splinter” called visiting the company’s headquarters “one of the greatest things I ever did in my life.” (68) During his visits, Williams could be seen sorting through piles of wood in search of the best of the best lumber for his bats. 2. You can trace the development of the iconic Louisville Slugger brand. Starting with professional sports’ first pitch man, Honus Wagner, who lent his name to Louisville lumber, forging direct relationships with players has been vital to the company’s success. Babe Ruth demonstrated his esteem for Louisville Slugger when he donated a 1927 bat, responsible for a third of his home runs during the historic 60-home run season, to the company. Before all that could happen, however, the company needed a visionary. Louisville Slugger originated as J.F. Hillerich Job Turning. The woodworking shop cranked out bedposts, chairs, railings, butter churns and more. Bud Hillerich had his work cut out for him trying to convince his father on the merits of making bats. As with any good story, there are several legends of how the bat came to be. One tale has Bud watching his favorite player at the ballfield in lieu of working at the shop. When Pete Browning’s bat broke, Hillerich swooped in after the game. He promised to make his boyhood idol a suitable replacement. The next day Browning, known as the “Louisville Slugger,” notched three hits with Hillerich’s bat. The game has changed, the equipment has needed tinkering, but in the end, it’s all about the wood that makes the inimitable crack. 3. The photos alone are reason enough to pick up this book. A young Ken Griffey, Jr. stares at the photographer with youthful brashness, as if to say, “It’s just me and my Louisville Slugger against the world.” Jim Thome stands in the batter’s box with the barrel of the bat extended toward the sky. A woodworker delicately crafts a bat in the factory. Ty Cobb gives a long look at a pile of bats to make sure he selects the right one. Honus Wagner lives on in a 1917 photograph. Stan Musial readies for work with a trio of bats. 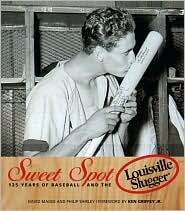 The book is packed with timeless photos, all with a common grain, Louisville Slugger. Sam Miller is a graduate of the University of Illinois where he worked with various teams in sports information and received the Freedom Forum – NCAA Sports Journalism Scholarship for his achievements. During the 2009 season, Miller served as communications intern for the Angels’ Triple-A affiliate. Prior to that, he worked as a communications intern for USA Basketball and as an associate reporter for MLB.com.